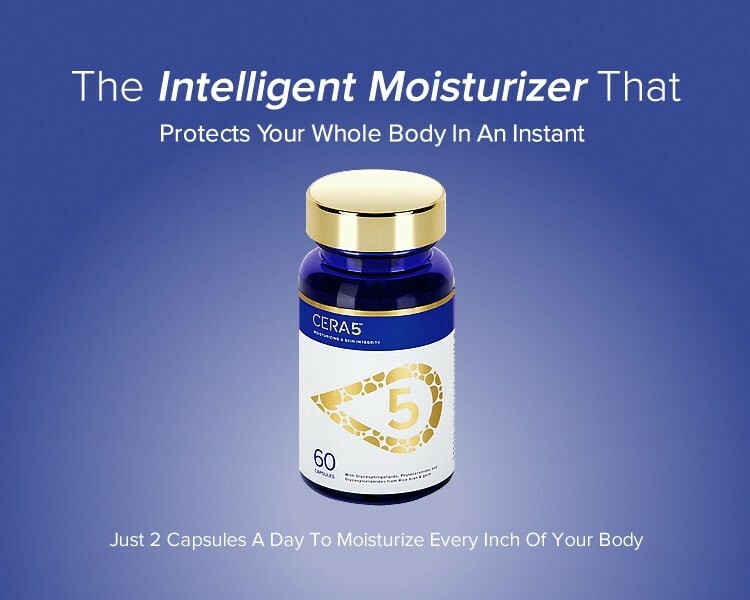 Cera-5™ is a powerful skin-hydration promoting food supplement that is developed to provide an endogenous (body self-producing) NATURAL MOISTURIZER for the whole body and to provide SHIELD to our skin from daily insults. When you have dry skin, it tends to feel tight, flaky in spots and appears dull, especially your hands, cheeks and around your eyes. Severe dry skin may lack elasticity, which accentuates fine lines and wrinkles. And for some people, it itches, burns and cracks! Your skin is comprised of 40% ceramides. This is the structure within your cell that allows you to retain moisture. The stronger your cells are, the more moisture they can hold. Thus, your skin will look and feel smoother, softer and more suppled. moisture naturally from inside out. toxins, UV exposure, and stress. 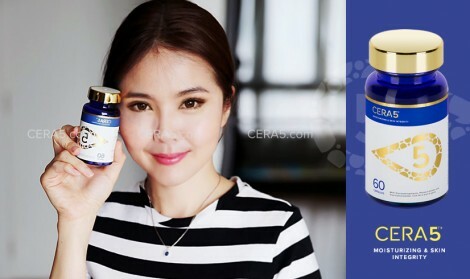 Cera-5™ formula contains the No.1 ingredient to younger looking skin. A revolutionary approach to anti-aging supplement. Strengthen your cells and allows your skin to retain more moisture naturally! peeling, flaking, cracking, redness and itching. on the moisturizer right after you get out of the tub. Hydrating from the inside out. This saves time and 100% of your skin’s territory is taken care of. In addition to keeping your skin soft and supple, hydrating from the inside out has the additional health benefits of keeping your general health and bodily functions at peak performance levels. The most important benefit worth mentioning is MOISTURIZING your skin until it is as supple as an infant’s. The other important benefit is that of SKIN PROTECTIONor DEFENSE (increasing invincibility), reinforcing our skin-barrier against the harsh environment outside. This makes the skin tough against wear and tear and the daily onslaught of chemicals permeating our home and workplace. 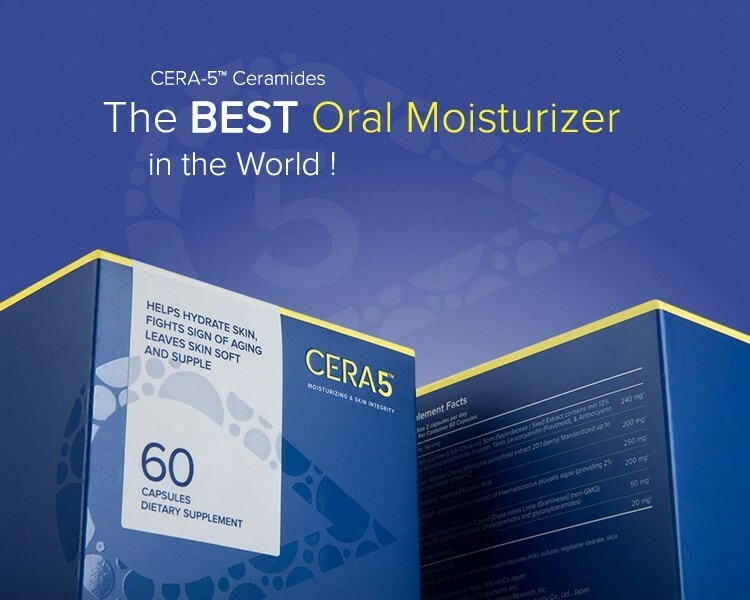 Cera-5™ Ceramides was demonstrated to be effective in prevention of skin dryness and roughness. Therefore, the dietary supplement containing rice-derived ceramide evaluated in this study may be a safe and superior beautifying agent, showing the effect by oral ingestion. 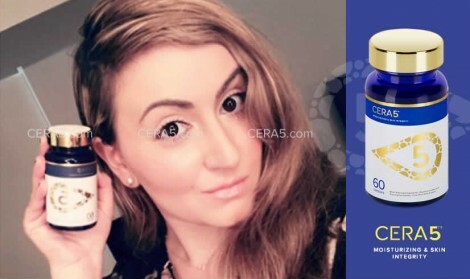 • 92% of women of Cera-5™ Ceramide Group resulted in increased of hydration degree. 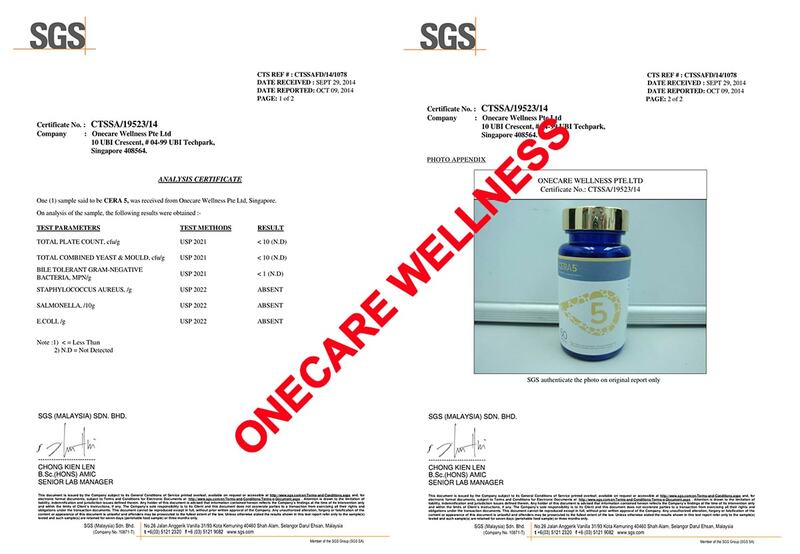 • Clinical evaluation: cutaneous dryness and redness were significantly improved in Cera-5™ group. • Hydration measurement: Cera-5™ significantly increases the hydration degree on both arms and legs. 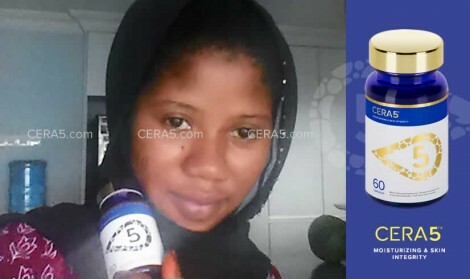 This increase was higher with Cera-5™ compared to placebo. • Self assessment: Cera-5™ was being perceived more efficiently by volunteers than placebo all along the study until the end. Why a Supplement for Skin? Ceramides have been used in topical solutions for many years but it only works under a superficial level. There are hundreds of cosmetics containing ceramide out there, but the skin is designed to keep things out. This could be why topical cosmetics are usually poorly absorbed by our skin. Aging skin is especially prone to poor absorption because the lipid balance is damaged from age. What’s different about Cera-5™ is that it works internally instead of externally. Cera-5™ ceramides is an active compound derived from rice. Most plant-based ceramides are not absorbed well or retained in the blood. Furthermore, plant-based ceramides are highly unstable and tends to quickly become rancid. Our supplier from Japan took the lead in resolving this impasse by investing in a new ceramide harvesting process from rice. For years, the Japanese have been researching a way for the body to improve skin barriers by trapping and increasing the moisture content of skin. They succeeded when they discovered Cera-5™, a patented bioenhanced preparation of ceramides that are part of the essential ceramides used to keep our skin smooth and strong. 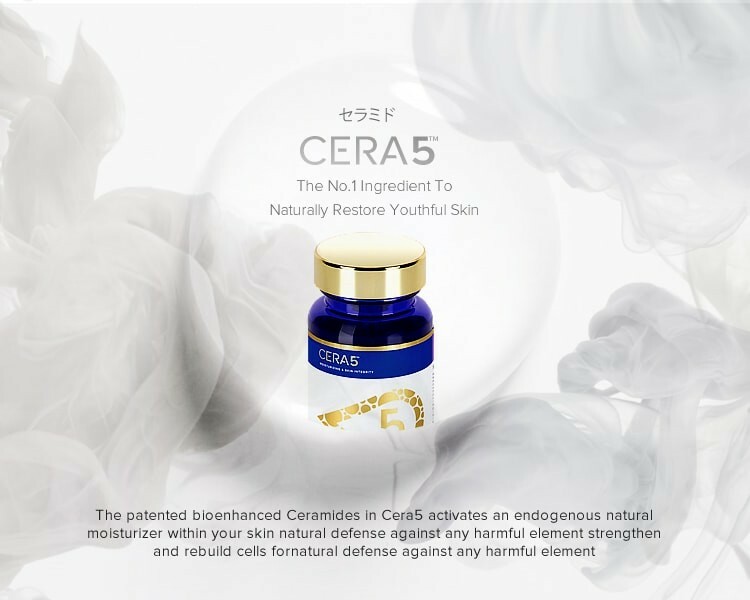 Cera-5’s ceramides are made purely from rice (instead of Konnyaku potato or wheat), making it the most stable and effective form of ceramide for skin. 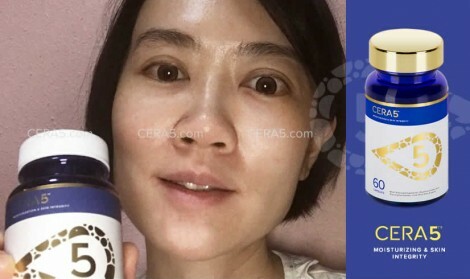 The moisturizing effects of Cera-5™ Ceramide was compared to other commercially available ceramides Rice based ceramides demonstrated superior moisturizing effect with a moisturizing ratio of 35%. How long before I can see the Wonderful effects? Start seeing results in just one week, then look younger with each week of usage. On long-term usage, it defies your age to look at least 10 years younger! and retain your youthful feminine beauty. 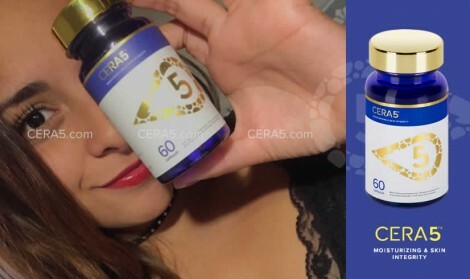 How long does Cera-5™’s effects last? 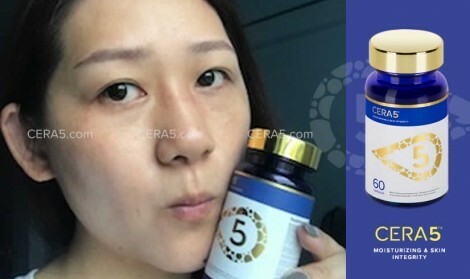 The effects of Cera-5™ typically last a month or more, depending on your lifestyle choices such as sun exposure, diet, and stress. This is because ceramide stored in your body are continually used over time. Every individual is different and results will vary based on lifestyle and diet—83% of users agreed that their whole body will look revitalized. Generally you will notice results first in suppleness, and radiant within the first 1-3 weeks. By weeks 6-8 you should notice an improvement in your skin’s firmness and suppleness. The key to long-term results is long-term usage, keep taking the Cera-5™ every day. 80% of users noticed smooth, softening and radiant appearance of the skin as first result. 78% of users noticed body moisture retention and worked more efficiently on dry skin after 2 weeks usage. 80% of users noticed reinforcement of the natural lipid barrier of dry skin. 80% of users reports on reduction of itch and redness after 3 weeks usage. 90% of users noticed improvement on yellowish skin, leaving skin with pinkish tones. 85% of users felt reduced fine lines and wrinkles. Improvement of the structural integrity of the skin. 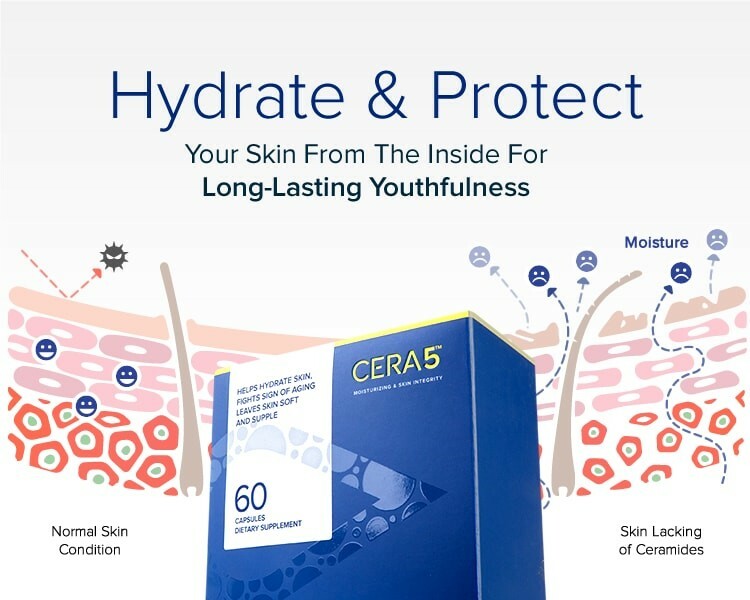 Cera-5™ contains cutting edge food ingredients that are derived 100% from natural food sources that are validated by clinical studies to confer skin protection and age-defying properties. Ceramides are naturally occurring lipids found naturally in the upper most layer of the skin. Ceramides pass through cell membrane and cannot be stored in the body. The only way to get them into our diet is through supplementation. Level of ceramides declines with age while factors such as stress, poor nutrition and environmental contamination may accelerates the process. Ceramides maintain skin hydration at cellular level, boosting the renewal process from inside and out, keeping skin healthy and young. 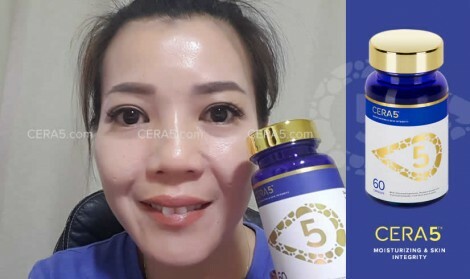 Cera-5 allows your skin to continue to do this as you age. Although Cera-5™ And Ag-Factor™ have similar benefits, both targets your skin with a complete different approach. 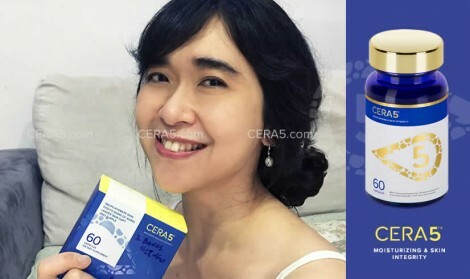 Cera-5™ is mainly to Boost and Lock Moisture within the skin. 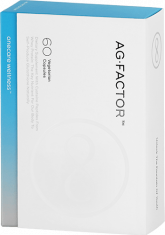 While Ag-Factor works from liver to clean your blood, enabling your body to produce glutathione as well as to balance your hormone. Hydrate your skin from the inside out, thus filling in wrinkles, smoothing and softening skin and strengthening your cells for longer lasting and obvious results. 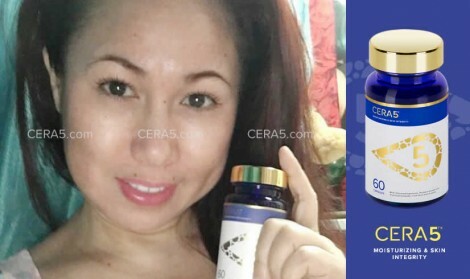 Work naturally enable your body to work more intelligently to produce your own glutathione and collagen. It will help brighten your skin to a radiant glow and leave it smoother and firmer. Supplementing with Cera-5™ can help repair the skin by resupplying our ‘wall’ with ‘bricks’ to rebuild our defenses. Doing so will help avoid age-related skin problems such as atopic dermatitis and infections from weakened skin. Our skin is the first line of defense against microbial infection, keeping all kinds of dirt and bacteria away from our sensitive internal organs. Keep Moisture Locked Inside the Skin. Cera-5™ Helps More Than Just Moisturize. Studies have found that old, damaged, or diseased skin has far fewer natural ceramides present in the skin. Scientists have found that supplementation or medication has proven to be an effective method of fighting common skin diseases such as eczema and psoriasis. ● New clinical research studies have shown that people who have eczema have significantly fewer ceramides under such skin condition. ● People with psoriasis (another itchy, flaky, rashed skin condition occasionally confused with eczema) have fewer number of ceramides as compared to people with normal skin. 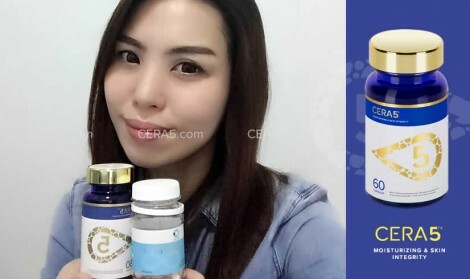 All testimonials can be found at Cera-5™ official Facebook page, all comments are from our satisfied customers with their real profile. 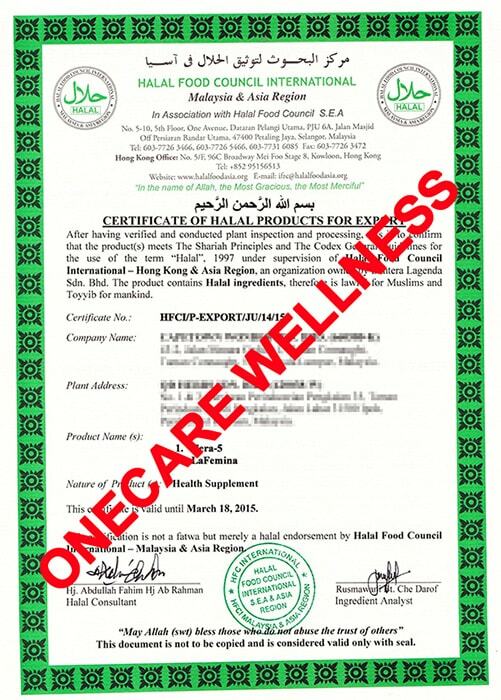 ● PhytoAbsorb® is a trademark of TangierNutra, Inc.
● ProBio-Enhanced™ is a trademark of GeroNova Research, Inc.
2 capsules daily on an empty stomach.